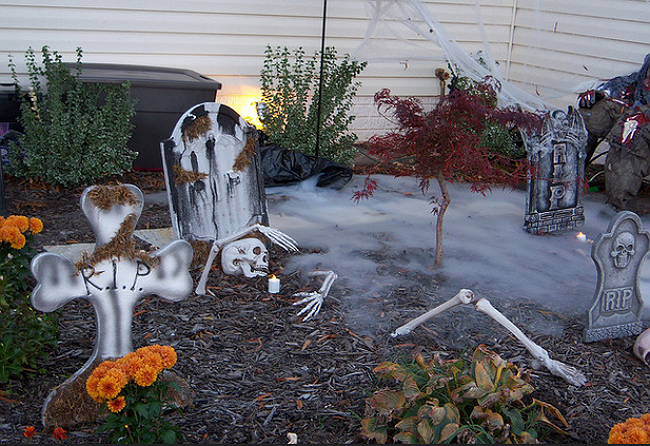 One-up your neighbors and take your haunted Halloween display to the next level with a DIY fog machine—all for under $10! There are certain things to expect in October: pumpkin picking, state fairs, an extra trip to the store when your candy arsenal runs low—and some friendly competition between neighbors. If you live on a block that goes all out for Halloween, complete with tombstones, skeletons, and oversize spiders, it might be time to step up your game. Fortunately, the key to a truly spooky house is both easy and inexpensive: the ghastly glow from a DIY fog machine. The secret ingredient in a homemade fog machine is dry ice, the solid form of carbon dioxide. Drop it into hot water, and the temperature difference turns the solid into water vapor, or “fog.” With this chemistry trick in mind, self-described tinkerer and Instructables user Kipkay rummaged through his recycling bin for materials he could use to build a contraption that could fog up his walkway. He chose a large, emptied-out coffee can for the base and, to dispense the fog created by the melting ice, attached an old computer fan to the lid of the coffee can through a cut-to-fit hole. (The process of tracing the fan onto the lid, cutting along the outline, and fitting the fan in place so that the air flows into the can is strikingly similar to the structure of that DIY air conditioning unit we discovered this summer.) With its wires connected to a 9-volt battery clip, the computer fan has enough juice to operate for up to two hours. Finally, Kipkay attached a hose to serve as an exit for the billowing fog. 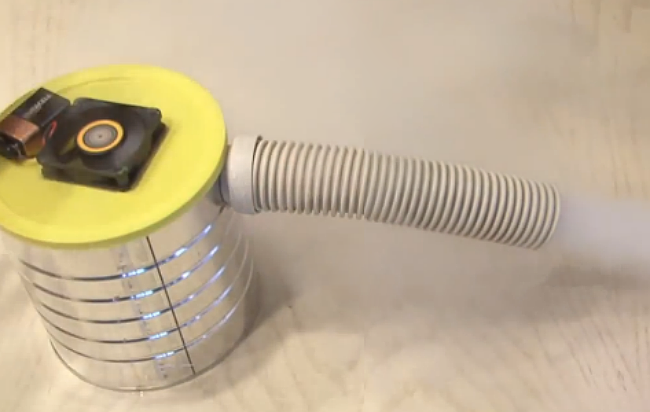 This machine uses a section of a pool hose, but don’t be afraid to get creative! Use whatever you have around the house; even a gutter downspout or a long vacuum attachment will do the trick. A hole cut through the side of the can—Kipkay used metal shears and his Dremel to get the job done—and a few drops of hot glue will ensure a snug fit for the hose. Want to test out your handiwork before the big day? Pick up some dry ice at your local big-box store, and heat up some water on your stove. Pour the heated water into your coffee can, and hook up the battery clip to the fan so your machine is ready for action. Then put on a pair of thick work gloves so the ice does not come into contact with your skin, drop the dry ice into the can, and replace the lid. Once you get the computer fan whirring and the dry ice starts reacting with the hot water, thick fog should come pouring out of the hose. With your fog machine hard at work outside, the gray haze settling over the yard will make your front walk feel like a graveyard after dark. Sure, you’ll save some money this October with your compact machine made of recycled parts, but the real joy of this DIY lies in the way a little smoky fog will heat up even the simplest Halloween display! And now, with your very own fog maker close at hand, you’ll never have to haunt the seasonal sale section again.